The Lauhala Box gift wrapping service is the perfect companion to anyone who appreciates Hawaiian products and Hawaiian culture. Coming in 2 different sizes, we will pick the one that will perfectly complement any items being purchased. 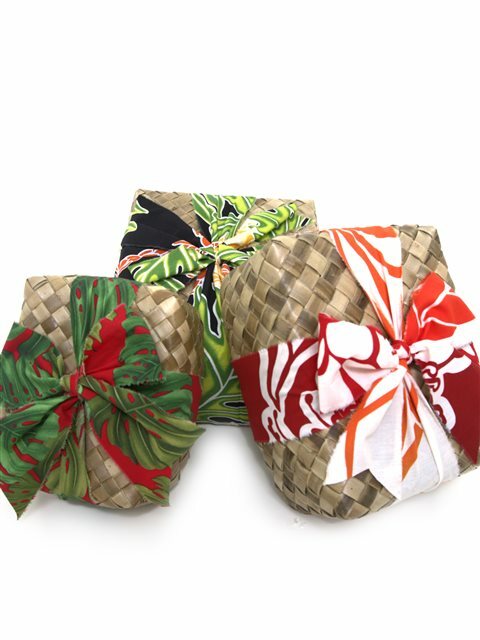 Each box is made from Lauhala, a traditionally used Hawaiian material, and is individually packaged and topped with a Hawaiian print fabric bow to bring a bit of color and that “Hawaiian Style”. Purchase the gift wrapping service and you won’t just be sending gift items but also a unique Lauhala container that can be kept and used for a variety of uses in the future. Perfect for smaller items like hair clips, leis, or other small items. Items will be wrapped within the Lauhala box to ensure no damage in transit. If you would like to include a short message to a gift recipient you can write a short 1-2 sentence message in the “special request box” in the checkout process. We will hand write the message on your behalf and include it in the box along with your name. Or if you prefer, we can provide a note card letting the gift recipient know that the gift is from you. Lauhala box measurements are approximate outside measurements. Slight variations in color and sizes are characteristic of natural fibers. One Lauhala box per order and all items in the order will be placed into the Lauhala gift box unless specified otherwise. If you only want to include certain items in the Lauhala gift box please specify which items in the “Special Request” box. If items are oversized or all items are not able to fit in the Lauhala gift box we will contact you letting you know and asking you how you would like to proceed. Fabric used to create bows may be different from the ones used in the photo. If you have a special request we can try to accommodate as best as we can but we cannot guarantee a specific material. No returns for the Lauhala Box Gift Wrapping Service. Exchanges on defective boxes only. Beautiful wrapping, really added to the whole affect.